Context: Finished this off on this bench at our friends’ house in Newcastle-upon-Tyne. Like, Coetzee, Toibin writes in sparse prose that is so wonderfully crafted in this novel that he manages to load each sentence with pages of meaning. This is a poignant, thoughtful and, at times, tragic novel that takes the reader on a journey through a man’s thoughts and memories. I loved it. I knew nothing about Toibin before picking this up. I’ve since found out that there’s an awful lot of his own childhood in the setting and events that Eamon Redmond, the central character, remembers as he dwells on his past. He’s a judge and has climbed to the height of his profession. At the same time, he is dogged by his inability to progress in his day to day relationships with his wife and children although there’s a glimmer of hope with his grandchild as the book closes. 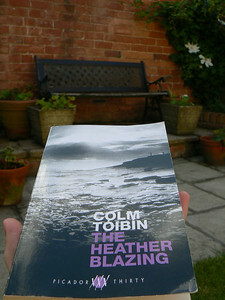 Throughout, Toibin uses landscape and, in particular, weather as important characters too. There’s the ever eroding cliffs around the summer home where most of the novel takes place, there’s the beach which keeps drawing him back to swim in water whose temperature is tempting to avoid and there’s the rain which takes on a whole range of personalities in the present and the past. For such a short book, and for one which is written a in very economic style, there’s a huge weight of poignancy in it. Particularly for me, as a married man of 13 years, it made me consider how I communicate with my wife and the whole fragility of life, the brevity of it. Definitely worth a read. Eamon Redmond stood at the window looking down at the river which was a deep brown after days of rain. Eamon began to carry him slowly in towards the shore.